Successfully Added MeeGoPad T03 Pro Windows Mini PC Stick - Unlicensed Win 10, Quad Core Cherry Trail CPU, 2GB RAM, 32GB Memory, Wi-Fi, BT to your Shopping Cart. 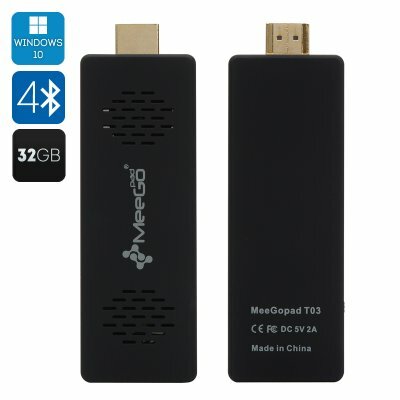 The New Meegopad T03 Pro is a step up from the first T03 computer stick and has replaced the CPU with the newer and faster Cherry Trail. Coming with a full version of Windows 10 and license key the ultimate TV accessory is back and ready to bring you that compact PC goodness in it pocket size form. The easiest way to improve your TV experience this affordable TV dongle brings you a fully fledged PC that can fit in your pocket for less than you’d expect. Now everyone can benefit from the Windows 10 experience as this TV stick is suitable and within the budget of all users. The MeeGoPad T03 Pro will let you access a wealth of great online entertainment such as TV shows and films as well as a number of games and educational resources. With the full Windows 10 functionality it’s great for work, study and entertainment. This MeeGoPad T03 Pro Mini PC dongle comes with 12 months warranty, brought to you by the leader in electronic devices as well as wholesale mini PC sticks..